Devotion to the Fourteen Holy Helpers originated in Germany in the 14th century. 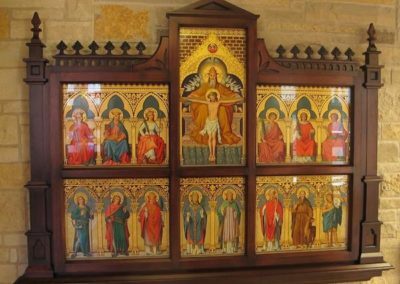 When venerated together, they are believed to intercede against various diseases: The Fourteen Holy Helpers panels were part of a side altar in the original St. Joseph Cathedral and were stored for later use in the new Cathedral. In numerous areas the paint had chipped and flaked off. Imported from Huesel and Rorbacher in Germany in 1885, the panels were restored in the first half of the 20th century by Sr. M. Marietta Hackner, FSPA. The panels were carefully transported to Conrad Schmitt Studios, inspected and cleaned. A barrier varnish was used to consolidate and protect the existing paint. Missing areas were carefully matched with paints and gold leaf. 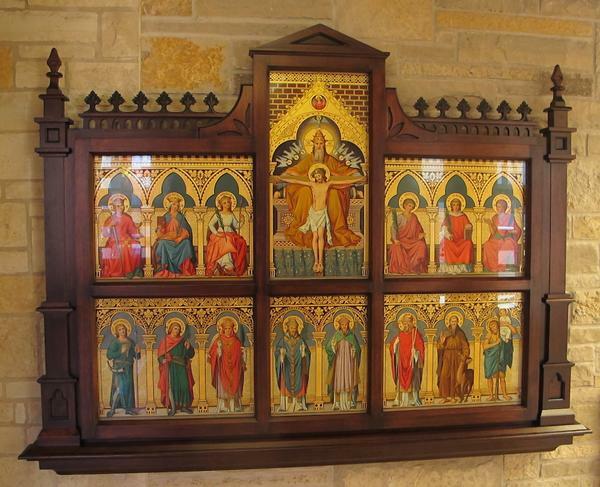 CSS artisans designed a new frame that honored the appearance of the original altar. The frame provides natural air convection and uses proprietary non-glare glass. The frame color and lighting highlight and enhance the panels. St. Acathius (Acacius): Protects against headaches and the agony of death. St. Barbara: Protects against fever, lightening, fire and sudden death. Patron of builders, artillery-men, and miners. St. Blaise (Blase, Blasius): Protects against illnesses of the throat. St. Catherine of Alexandra: Protects against diseases of the tongue and sudden death. Patron of Christian philosophers, maidens, preachers, wheelwrights, and mechanics. St. Christoph (Christopher): Protects against the plague, sudden death, and storms. Patron of travelers and motorists. St. Cyriacus (Cyriac): Protects against diseases of the eye and diabolical possession. Patron of peaceful death. St. Dionysus (Denis): Protects against diabolical posession and headaches. St. Erasmus (Elmo): Protects against diseases of teh stomach and intestines as well as domestic animals. Patron of sailors. St. Eustachius (Eustace, Eustathius): Protects against fire – earthly and eternal. Patron of hunters and family problems. St. George: Protects against herpetic diseases and offers protection to domestic animals. Patron of soldiers, England, Portugal, Germany, Aragon, Genoa, and Venice. St. Aegidius (Giles): Protects against the plague, panic, epilepsy, madness, and nigthmares. Patron of the disabled, homeless, and breastfeeding mothers. St. Margaret of Antioch: Protects against backache. Patron of women in childbirth. St. Pantaleon: Protects against consumption and offers protection to domestic animals. Patron of physicians and midwives. St. Vitus: Protects against epilepsy, chorea, legarthy, bites of poisonous or mad animals, and storms. The Feast of The Fourteen Holy Helpers is celebrated on August 8th.